Bao Dai's Villas is a dream hotel for a special holiday. 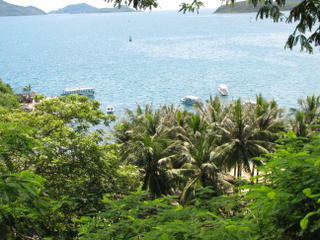 Located on top of five hills with great ocean views, the villas are surrounded by green plants and peace and quiet. The price is a bit expensive for the average back packer but it's reasonable for the middle rank, ranging only from $25 for the standard up to $80 for the deluxe. 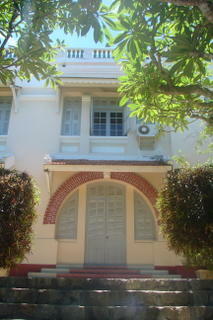 Bao Dai's villas are one of the few remaining examples of French colonial architecture in Viet Nam and were built in the 1920s as a holiday resort for the last Vietnamese King Bao Dai and Queen Nam Phuong. There are two restaurants in this hotel, one on the beach and the other on the second hill which is right next to the Queen's villa. 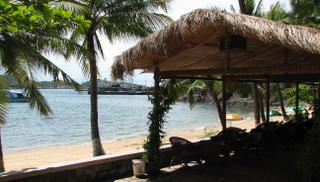 Super massages and other services are available on the private beach which cost you nothing. 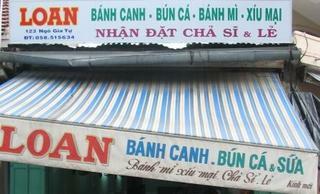 There are heaps of options here in Nha Trang for breakfast but you also can have many of them for your lunch or dinner. These dishes only cost you about 10,000Vnd. Hue style Beef noodle soup is my family's choice almost every morning. I love this dish because its special, spicy and not very heavy. It's served with beef, pig's blood, pig's feet and some veggies. 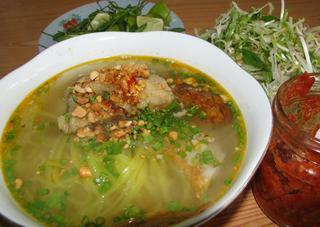 There are quite a few different fish noodle soups and they are all great and cheap, at only about 7000 Vnd. 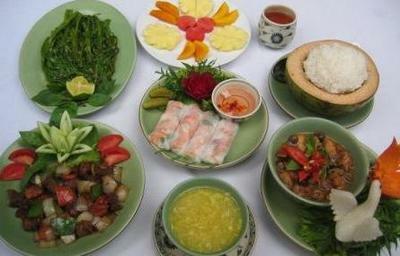 One of them consists of steamed fish and fried fish cakes with long noodles and vegetables. Another one is also served with the same ingredients but with different noodles which are long and round and without veggies. Glassnoodles are also popular at some noodle stands. Fried eggs and stewed beef with onion and carrot pickle seems like a strange choice for breakfast. 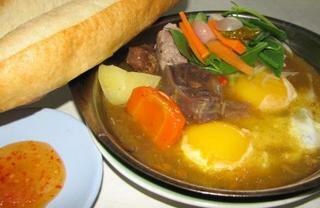 You can have it with some bread if you want which can be dipped into the stewed beef sauce. 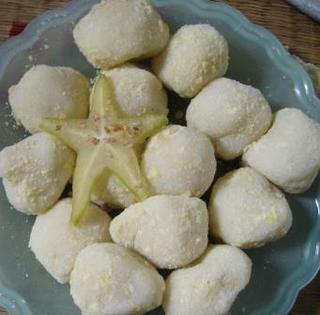 We call this dish Bo La in Vietnamese and it's only available in Nha Trang. Do not miss this dish if you have the chance. 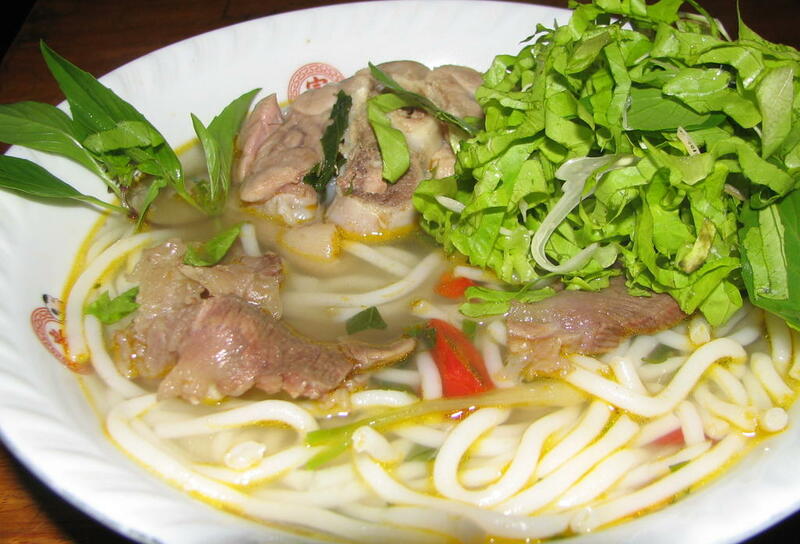 There are lots of small restaurants selling noodle soup with beef, pork, or chicken. They are all quite similar but with different vegetables. If you eat noodles with beef they would serve you lots of different herbs, salad and fresh or cooked bean shoot and green onion with some black sauce and chilli sauce mixed with fresh lime. Chicken and pork noodle soups are served with only mint and beanshoots. My Quang is another noodle choice for your breakfast. It's served with a very special and colorful yellow thin noodle, with cooked beanshoots, fish cake, dried onion, dried pig fat, crushed peanuts on the top, vegetables and very nice stock. And of course, do not forget to add some more chilli. This is Quang Nams' special dish. 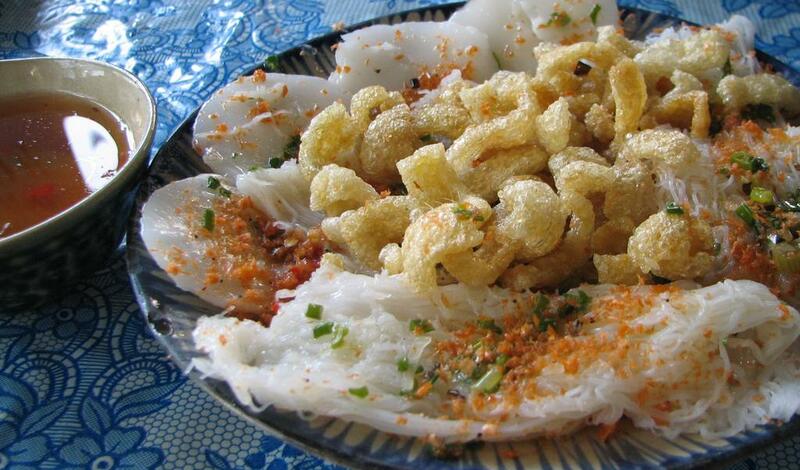 Steamed rice pancakes called Banh Beo is a nice small dish which is served with dried shirmps, dried pork crackling, a little bit of sugar and spicy fish sauce. Banh Hoi is a really nice thin mixture of noodles which are served the same way as Banh Beo but tastes slightly different. Make sure to ask for extra crispy crackling which makes the difference. 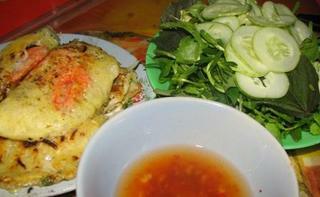 Called Banh Nam, another steamed rice pancake is cooked with minced shrimp, pepper, dried onion, and served with the same fishy sauce as the other steamed rice pancake. There is a vegetarian Banh Nam as well which is cooked with green beans. Banh Xeo is another kind of steamed rice pancake but I prefer them a little bit crispier than usual. It's cooked with bean shoot, shrimps, squid, and small quail eggs, served with vegetables and a sweet, spicy fish sauce, which is yummy. Ninh Hoa Spring rolls is such a super dish which you have to roll with your own hands. 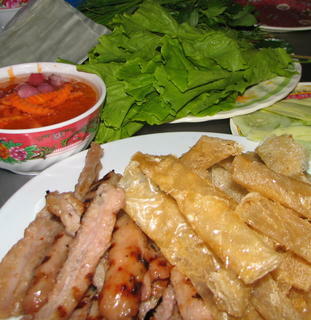 It comes with heaps of different veggies, crispy rice paper and long sticks of grilled pork. Dip in an orange sauce after adding some pickled shallots and carrots, cucumber, green mango and star fruit. There are two different chili sauces, and I think you should try some sweet chilly sauce if you can't eat really spicy sauce or mix them together. But before you try rolling your own Nem, you should try some Nem chua which are delicious. You have to unwrapp all the leaves to eat just a small roll inside made from pork. 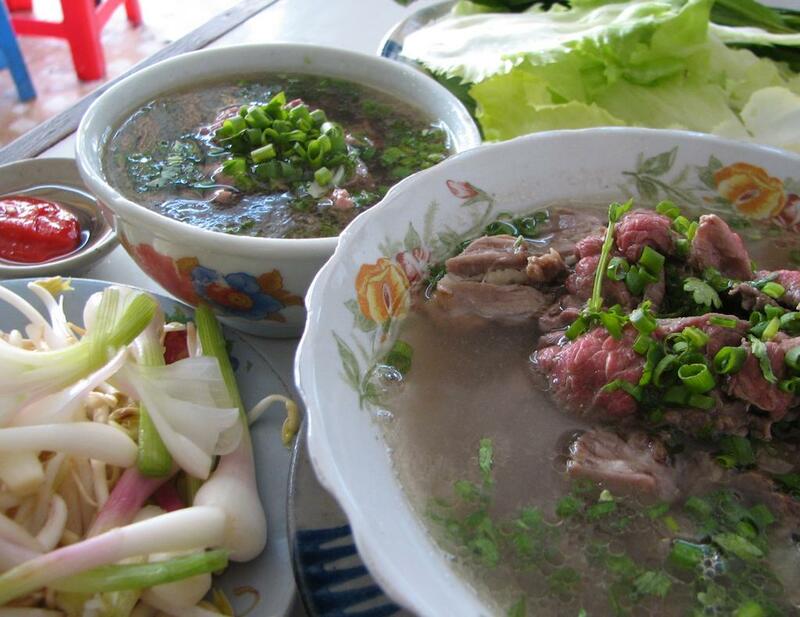 This is the best dish in Nha Trang which has been really famous in this city for years. This is one of my favorite hotels in my hometown, Nha Trang, which I always recommend to my friends. It's a really clean, comfortable hotel with sea views, even though it takes you 3 minutes to walk to the beach. New Sky is quite a busy hotel with reasonable prices with all kinds of services. 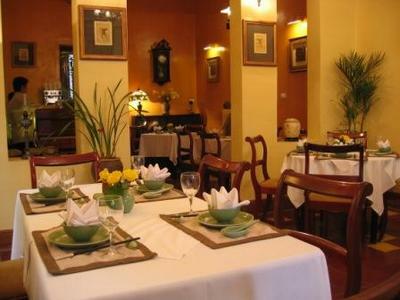 The staff are friendly, especially Mrs Huyen, the owner. This is a big hotel which has 70 rooms with air con and international TV channels. It has been open for about 5 years as a 4 storey hotel but has just been expanded early this year to include another 4 floors which have beautiful sea views and city views. Do you need to go to the market to buy vegetables and fruit? Yes, but it's not really necessary because there are heaps of ladies and men selling on the street. The price is cheaper on the street sometimes but you have to bargain harder. Sometimes it's better to know these people, so that they give you good quality produce or you might get below average stuff, which has insects or is going off. These people usually wake up at about 3 am, go to the early morning market to buy from the wholesaler, return home and start selling on the street at about 5 am till 6 pm. They usually sell two kinds of vegie or fruit, one which has a higher profit margin, and therefore pays more for their long hours of pounding! At Christmas and New Year, you can see lots of kids trying to sell fake Christmas tree decorations, hats, gloves, and little father Christmases... And lucky money envelopes, cards and coloured lamp-shades for the new year. The profit depends on whether they have a lucky day. Somedays, they are able to sell hundreds of these trinkets per day but some days just a few. This seems an easier job than other pavement pounders as they don't need to carry any heavy things except the branch of a tree on their bike. I wonder how many kids do this kind of business on these special occasions to make extra money for their holidays. By the way they talk and look, they seem to really enjoy doing this stuff themselves and selling it, and sometimes they donate it to some organization for charity. What a nice thing to know! Minh, my sister works as a chef at a big government hotel in Nha Trang. She starts her work day at 5 am and finishes at 10 or 11pm in the high season, when there are lots of wedding bookings. She's a really friendly lady, speaks just a little bit of English but she loves to try to make conversation whenever we talk together face to face or via the telephone. 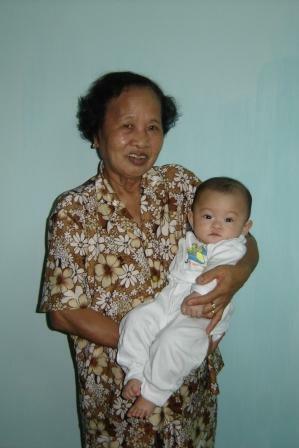 Minh and her husband, Thuc, have been trying to have a baby since 1985, which means it's 20 years next month. Finally, the gods have seen how hard they've been trying and have smiled on them and she has had two girls by invitrofertilisation(IVF) which cost them millions of dong. 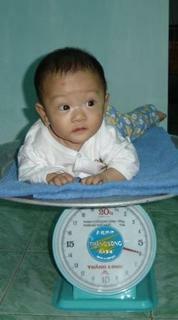 One of the girls, who weighed only 1.5 kgs, almost died when Minh gave birth one and a half months prematurely. The other girl was a bit better, but only 1.9 kg. After one year and a month, they are now 7 kg and 9 kg respectively. My family's really happy about this situation. 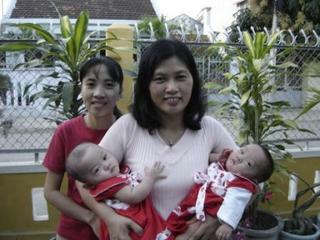 Thuc still can't believe that he has two daughters and that they are so beautiful. He jumped up and down in the hospital when he heard that he had two girls. He said he appreciated everyone who had been helping them, especially my mother, who supported them through good times and bad. "The babies are so gorgeous now and they can run around the house and have started to say ba ba, which means Papa," my Mum said. She's so happy to see my sister's family laughing and the babies' voices. Looking at Minh and Thuc when I was there at Tet, seeing them play with the kids gave me a really strange feeling that I don't know how to explain. I wish my sister's family happiness forever with lots of joy and laughter. You can buy baskets of all shapes and sizes right in front of your house from guys selling off the back of their bicycles. Quality can be a concern because you might get a really bad one which has tiny termites which we can't see with our naked eyes. This has happened to me a few times so you better check your basket carefully before you decide. Bargain hard with these guys and sometimes it is possible to reduce 70% from their price, which is actually the real price. More men sell dog chains, hammocks, cassette tapes, socks, keys rings and belts than women, because the people who buy from them might think that men know these things better? They hang them on their bicycles and ride around all day. The profit is minimal but the sales can be quite high. 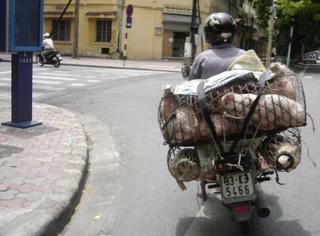 The most popular transportation in Vietnam is motorbike. Not surprisingly there are lots of "Xe Ôm" which means motorbike taxi on the street. Everyone can afford to travel this way, reasonable price and they are present everywhere. 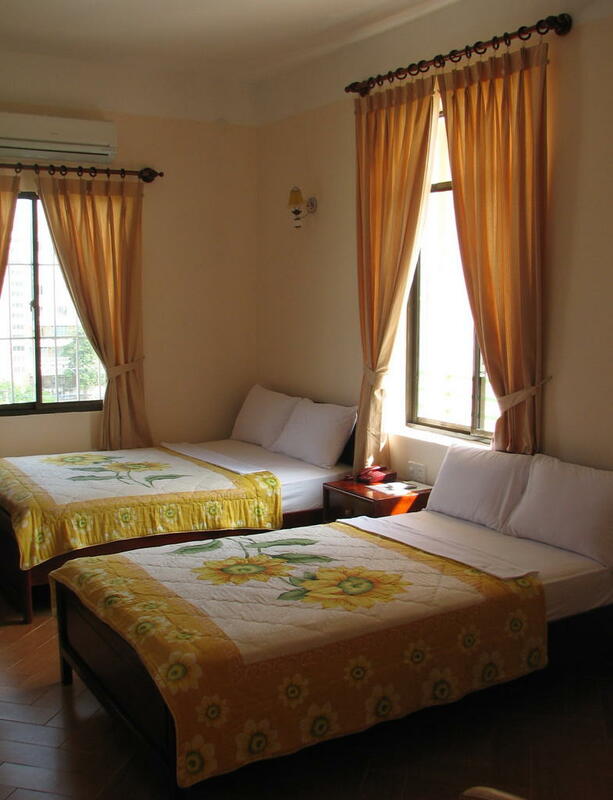 For 10,000Vnd that you can go for few kms which would costs you about 40,000Vnd in a taxi. The good thing about this service is you can see scenery but be careful which driver you choose. Lots of drivers in Hanoi drink rice wine during the day and they might give you a shock with the way they drive. Try to see how good you are in bargaining. People who sell on the street have less education and experience than other people. That's why they can't find a good job when they come to the city. Well paid jobs need high qualifcations and great experience. Because they don't have these then they don't mind to work hard in any conditions. I have great admiration for these people because of the hard work they do. I think I am so lucky that I have a good job with an acceptable salary. I usually help people on the street, just trying to give a small hand in a huge sky. Whenever you come to Hanoi, the weather might make you sweat in the Summer, cool and beautiful in the Autumn and Spring, really cold in the Winter. 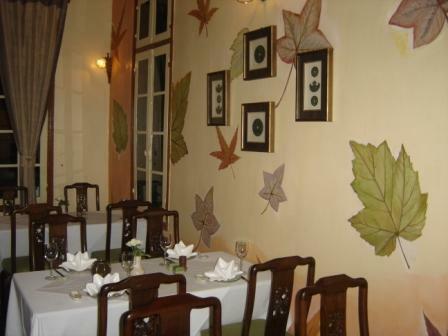 But if you come to have dinner at Seasons of Hanoi restaurant, you will experience amazing food, a warm and friendly atmosphere and unbelievably beautiful flower arrangements. This place features an innovative mix of traditional and modern Vietnamese architecture for the dining. They won the best dining of the year 2005 and many more years before voted by VietNam Economic Times and other foreign magazines. 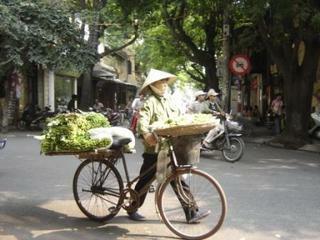 Seasons of Hanoi has been recommended by Qantas, Thai Airways and many more famous travel companies. The menu has a variety of choices. Why don't you try some banana flower and chiken salad, rice noodle, shirmp and pork wrapped in green mustard leaves or deep fried spring rolls with seafood and taro for starters. Some fried crab with tamarind sauce, pan-fried duck with orange sauce, deep fried fish with five spices sauce or grilled rolls beef in green mustard leaves, fried rice with roasted duck, sauteed eggplant with garlic for main courses. Vegetarian don't need to worry as there are many options on the menu. If you've still got room for dessert, try lotus seed sweet soup with young sticky rice or sweet rice corn in coconut milk. After the meal, go for a walk around nearby peaceful Trúc Bạch Lake. 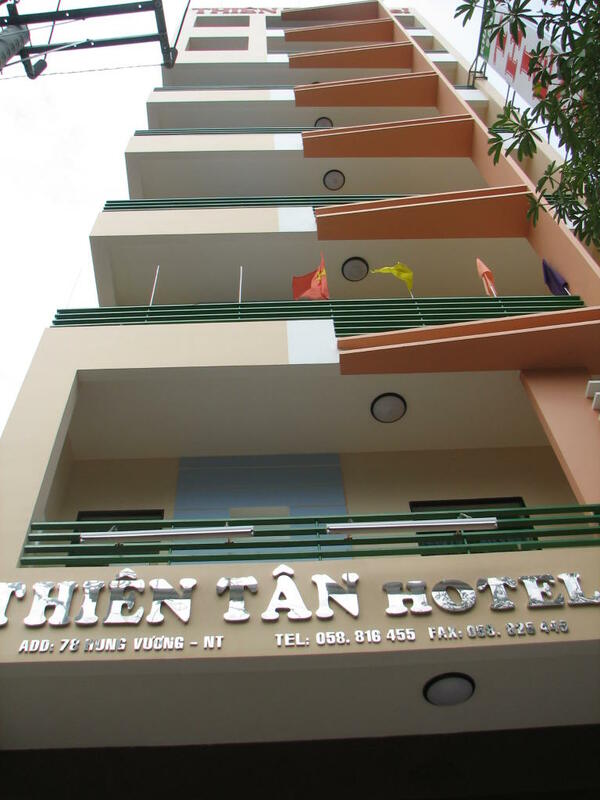 If you have any special requirements, do not hesitate to ask for Mr Thinh, the owner, who has great experience of Vietnamese food, flower arranging and function organization. It's best to ensure a table by booking in advance. 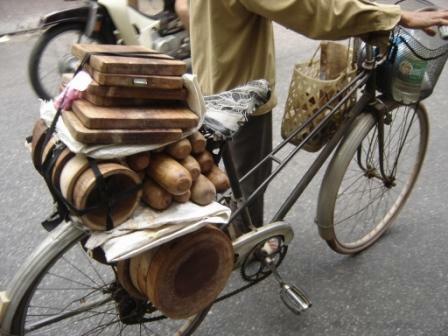 Most people who sell on the street are from the countryside. They come to Hanoi or other big cities trying to make a better life by doing any job, just to save a bit money to help their families and themselves. 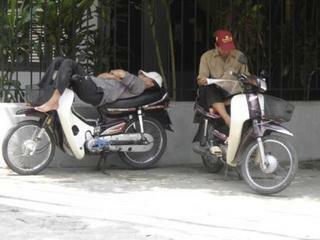 Life in a big city is not as easy as what they thought, as they have to work really hard to earn a little money. However, for many it's still better than hard farm labour. This rural workforce does all kinds of work here, from carpentry to fixing houses and cleaning dishes. 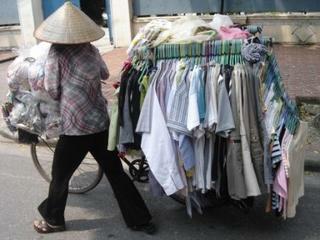 Daily expenses taken out, they earn around 30,000Vnd per day. Most of the women sell household goods, including bath room brushes, boxes, mops, brooms, washing baskets and plastic containers. 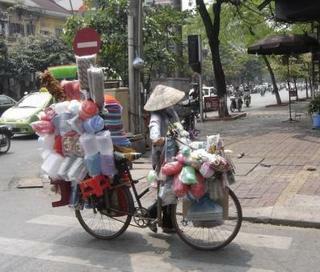 They put all of their things on a bicycle and push it endlessly around Hanoi. 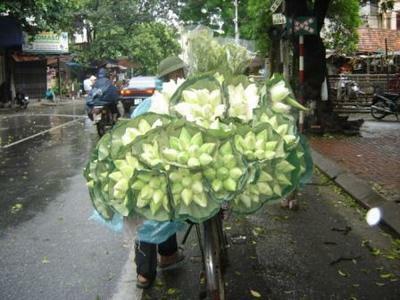 Other ladies earn their living by selling all different kinds of flowers following the season. These people have to wake up at about midnight, go to Nhật Tân's market, then return home to arrange the flowers and start selling at about 6am till 10pm regardless of the weather. 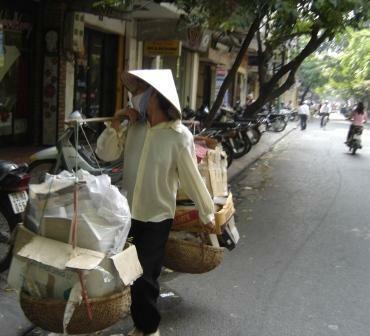 A common sight in Hanoi is a young girl or an old lady carrying two racks full of clothes, baskets loaded with womens' accessories or shoes. They look like a strange walking clothes shop. This kind of business is very popular in the north, not in the south. You always have to bargain for these goods and quality can also be a problem. Most people who operate these mobile businesses are from the countryside. 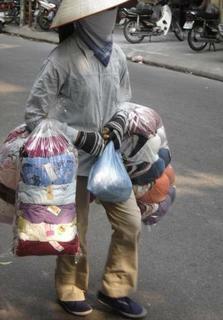 Their daily profit is about 30,000Vnd, not much for an 18 hour day. They walk along almost every street, meet lots of difficult customers but they still try to keep this business because this is their daily means of support. 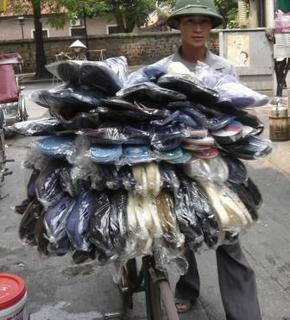 Plastic shoes cost about 6000Vnd, clothes cost about 20,000Vnd per item. Quite cheap but remember, "you get what you pay for." This is my favorite home decor place. Hoàng, the owner, who has five years experience in the field, has just opened his first show room on 55 Linh Lang Street, near the Australian Embassy a few months ago. 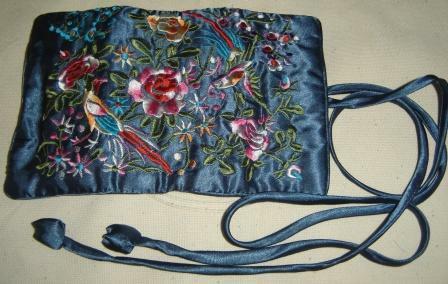 He does all kinds of home decor such as sofas, table cloths, pillows and pillow covers, lamp-shades and lots of hand made cloth including wallets, scarves, and wall hangings. 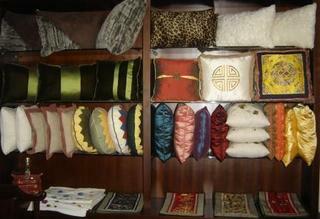 All of his products, of course, have a modern Vietnamese style to them. He has been doing lots of interior design for Citi Bank, big restaurants, hotels and foreigners' houses. I've heard lots of good feed back and, because of this, I've also introduced him to my friends and they seemed pleased with what they ordered. Today, I went to my colleague, Cảnh's wedding in Thái Bình, over 110 kms away from Hà Nội. The Meal at the bridegroom's home started at 9am and we finished at about 12. After our meal, Cảnh went to the bride's house to pick up and bring the bride to his home. It was a shame that we couldn't go to see the bride because we all had to go back to Hanoi for work but we enjoyed the meal and the warm reception from Cảnh's family. The people who were invited gave the Cảnh and his new wife money not gifts, like in the past. 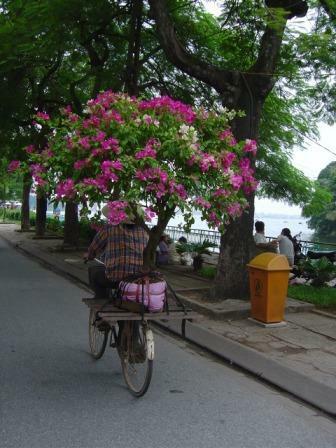 Another thing is that in Viet Nam we don't send a list of gifts that we need to our friends. Fifty thousand dong is a normal amount to contribute but it also depends on what your relationship is to the couple. In the countryside, people sometimes give from twenty thousand dong up to a few hundred thousand dong. The food was delicious and included stir fried Cat with chilli and lemongrass, steamed Veal with sesame, boiled Dog meat, Pork and mushroom cooked with vermicelli broth, boiled pork tongue, liver and stomach, Stir fried Carp with onion and tomato sauce, Deep fried chicken. "Bánh Dầy", a special cake made from rice for the cover and ground green bean in the centre, and water melon were for dessert. Hanoi beers, soft drinks, rice wine was provided in plenty around the house for everyone to toast the happy couple's future. Cảnh looked so happy and we all wish him the best with his new life.